Mission Gourmet Dinner chef and organizer Jim Murphy, center with Central United Methodist Church Senior Pastor David Yun, left, and former Pastor Ron Watts, right, with their families enjoying the fundraiser. 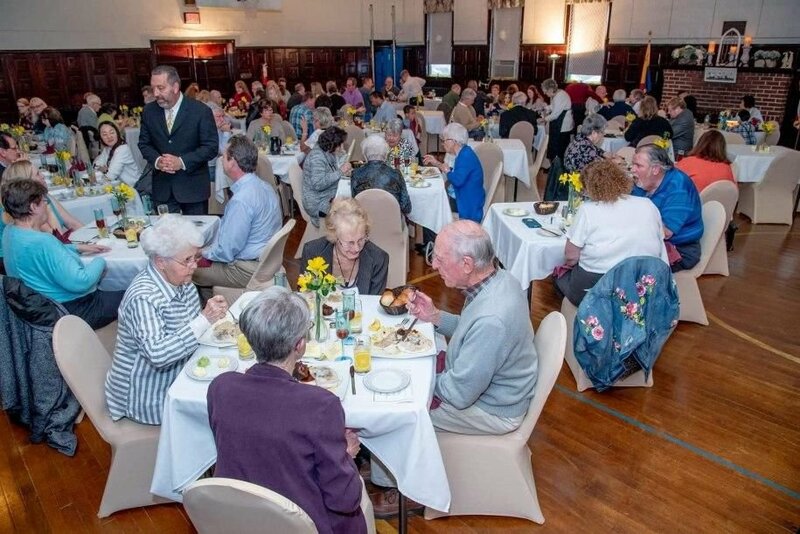 It was a full house for the 15th Central United Methodist Church Mission Gourmet Dinner held Saturday, April 6. Chef and organizer Jim Murphy, of Linwood, plates the s’more cake for the Central United Methodist Church Mission Gourmet Dinner dessert. Michele Verno, of Northfield, and Jared Rosenberg, of Egg Harbor Township, slice the pears for the appetizer of homemade flatbread topped with pears and gorgonzola cheese. Andrew Pozza, 11, of Linwood, helps to set the tables for the 15th Central United Methodist Church Mission Gourmet Dinner in the church hall. LINWOOD — The aroma floating in the air Saturday afternoon at the Central United Methodist Church could have rivaled any fine eatery. Adams Hall inside the church was transformed into an upscale restaurant with each table for four draped in white linens, with china, fresh flowers and napkins folded into a rose. Head chef and organizer of the event, Jim Murphy brought years of preparing lavish meals to the 15th Central United Methodist Church Mission Gourmet Dinner. Murphy and the chefs and volunteers who rolled up their sleeves to plan and create the seven-course gourmet dinner did so because, he said, they all love giving back to charity and making delicious food for people is a wonderful way to be able to help others. The eclectic, creative menu entices diners. This Mission Gourmet Dinner was a sellout as have been so many preceding it. The dinner began with thinly sliced London broil with chimichurri sauce and was followed by the appetizer of homemade flatbread topped with sliced pears, fig jam, gorgonzola cheese, chopped walnuts, Italian parsley and a balsamic glaze. The soup that followed: oven-roasted carrot and ginger soup with candied ginger and carrot cake croutons. A beautiful salad followed and then what Murphy said was a delicious creation, an intermezzo of root beer caviar. The entrees included a beef short rib with an amaretto demi glaze, a sesame lemon glazed cod and veal piccata with lemon, capers and white wine served with risotto. Dessert was a twist on an old favorite — s’mores made with graham cracker pound cake topped with dark chocolate fudge and homemade toasted marshmallows. While there were many cooks in the kitchen, there were also a great number of hands serving as well. Many from the church youth group donned their aprons to serve the patrons, bus tables and serve as runners in and out of the kitchen. Murphy said the dinner raised $6,300 that will be divided among the three chosen charities for this event: a local widowed mother who is battling cancer, the scholarship program for teens heading to college and the church general fund. Some of the past beneficiaries include The Hero Campaign, Sister Jean’s Kitchen, the Atlantic City Rescue Mission, Red Bird Mission, Soccer Balls for Haiti, medical assistance for paralyzed patients, a local family who lost everything in a house fire, bullet-proof vests for police officers and the Reilly Hospital for Pediatrics. But Murphy was quick to say that all of the money raised would not be possible without the 30 benefactors, sponsors, restaurants and establishments in the community and region who donated more than 90 percent of the supplies used in the dinner. “We could never reach this goal without their heart of generosity,” said Murphy.